We are waking up and realising that this world isn’t made with our success in mind. 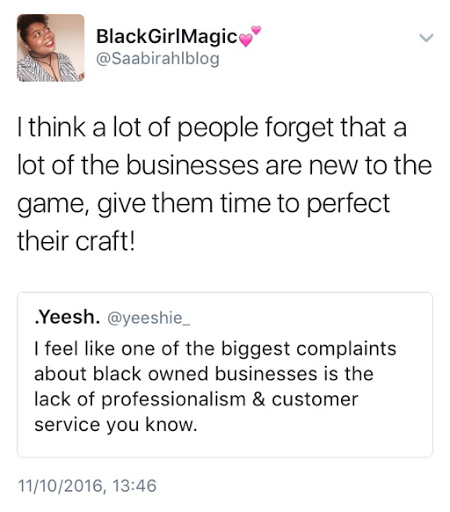 We have to make our own success and the best way to do that is to create and support black owned businesses. Everyday I’m thinking about what I could do to contribute to this movement. Supporting black owned businesses doesn’t have to burn a whole in your pocket, you can actually support a BOB (Black-Owned Business) for free; ‘6 FREE Ways To Support Black-Owned Businesses’ This is just one of the ‘Quirky, Brown Love’ posts about BOBs. There’s also a ‘How To Shop Black-Owned Businesses For Everyday Life’ post on their amazing site. The rise in BOB makes it slightly more easier to get involved. There are restaurants, hair products, events and so much more fields that Black men and women are getting into. I have created Wishlist that are specifically products and services that are Black-Owned; ‘Buy Black Wishlist #1’ & ‘Buy Black Wishlist #2’. Word of mouth and social media are great tools that should be used a lot more to raise awareness of some of the great BOBs that are out there. I’ve seen what my #BuyBlack Wishlist’s have done and also I’ve recently reviewed a deep conditioner on my instagram and since then I’ve seen a few people show interest in the products and also the business. That support wasn’t free but I didn’t mind spending a few pounds on some great products. Something we all notice is the lack of trust in BOBs. I’m not really sure where it stems from, but I think we forget that with new businesses, especially a black owned business money is tight. A lot of the time we don’t have the same links or connections as other mainstream businesses. We all have to start somewhere, prices don’t just magically drop. We have to understand that the price of everything will start off high as these businesses have to make a profit, plus pay for all the extras we don’t see or think about. Those prices only drop when they’re making a significant amount. So consistent support is needed.